On Tuesday 26 April Cardinal Vincent visited his titular church in Rome, Sant’ Alfonso, for the 150th anniversary of the return of the icon of Our Lady of Perpetual Succour to public veneration. The celebration began with a procession of the icon to the church which was followed by Mass. Cardinal Vincent went on to consider the history of the icon which was a treasure of the church of St Matthew which stood on the site of Sant’ Alfonso in the fifteenth century. It is known that the icon was removed by Augustinians in 1798 as war raged in Rome. The enthusiasm of a particular Augustinian Brother, Augustine Orsetti, for devotion to Our Lady of Perpetual Help was passed on to a boy called Michele Marchi, who later became a Redemptorist. When it was discovered that land newly acquired by the Redemptorists was the original site of the church of St Matthew, Pope Pius XI approved their request that the icon should be placed in the new church for public devotion. 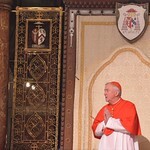 To read the full text of the Cardinal's homily, click here. To view more pictures of the procession and Mass, click here.